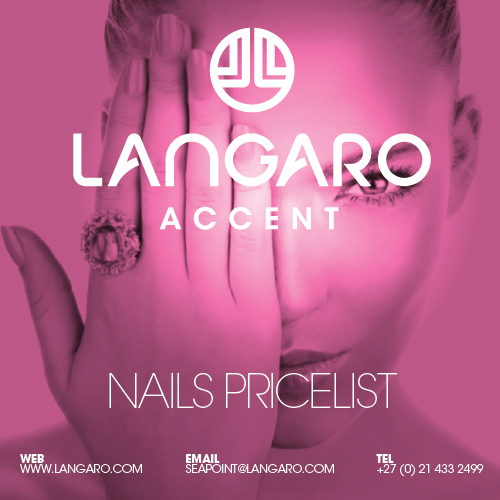 Langaro are the nails experts in Cape Town. 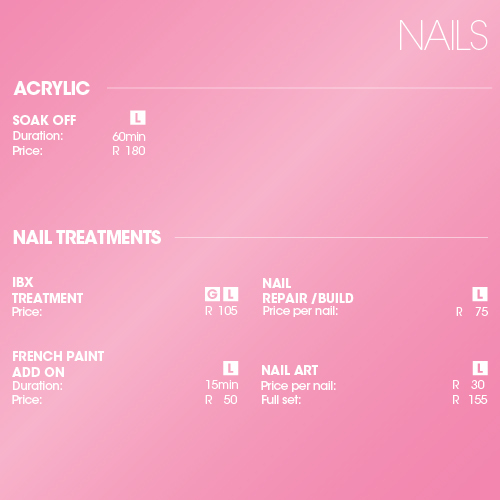 We have created an unique nail salon experience and a space of social sanctuary, where you can expect a relaxed and friendly atmosphere within the most hygienic of surroundings. 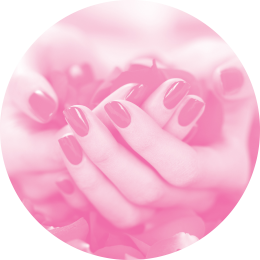 From manicures to pedicures, to personalised designs, our team of talented nail technicians aim to deliver an unmatched level of customer service with a flawless result; every time. Consists of filing, buffing, shaping each nail, pushing and clipping the cuticles from the nail plate, complete with an application of nail polish. Consists of filing, buffing, shaping each nail, pushing and clipping the cuticles from the nail plate, exfoliation of the hands, hand massage. Complete with an application of nail polish. Consists of filing, buffing, shaping each nail, pushing and clipping the cuticles from the nail plate, exfoliation of the hands, hand massage, application of an OPI softening hand mask which is left on for 10 minutes and completed with an application of nail polish. Immerse your tired feet in a bubbling spa laced with fragrant oils and salts, then drift away while your feet are taken to heaven and back – Nails Trimmed and filed, cuticles treated, feet exfoliated and buffed, feet massaged to the knee and then toes polished to perfection with your choice of colour. Is an express service that includes nail clipping, filing and shaping of your toenails, pushing and clipping the cuticles from the nail plate. Complete with an application of nail polish. 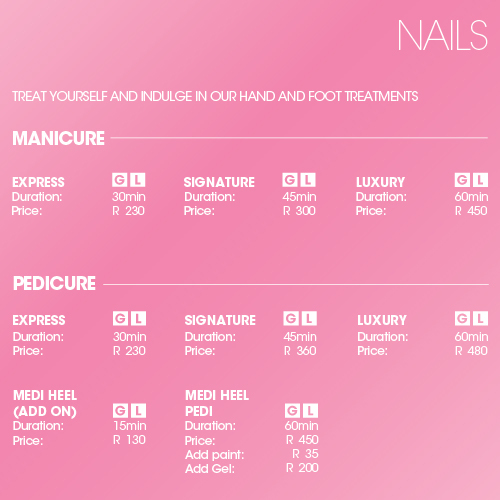 Consists of nail clipping, filing and shaping of your toenails, pushing and clipping the cuticles from the nail plate, buffing followed by an exfoliation, a foot massage and completed with an application of nail polish. 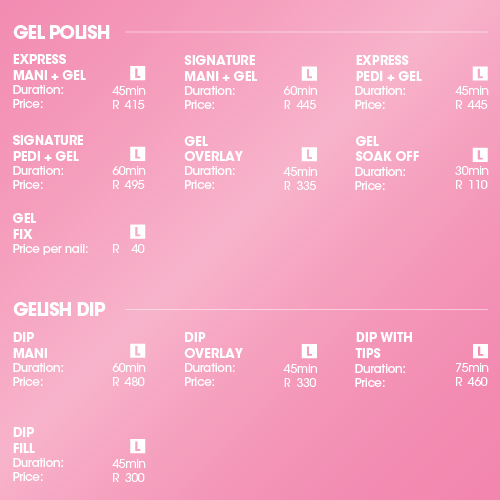 Consists of nail clipping, filing and shaping of your toenails, pushing and clipping the cuticles from the nail plate, buffing followed by an exfoliation, a foot massage, application of an OPI softening foot mask which is left on for 10 minutes and completed with an application of nail polish. For a long lasting, long shining gel polish that lasts for weeks without chipping, no wonder gel nails from Langaro are impressive. Book for two people at the same time and your 30min back, neck and shoulder massage will be upscaled to a 60min full body massage.